Scaly face is most commonly caused by Knemidokoptes - also spelled Cnemidocoptes, which are eight-legged microscopic mites that are related to spiders, ticks and scorpions - but obviously much smaller in size. Different species of mites affect different species of birds. Knemidokoptes are most frequently found in budgies; however, they have also been reported in other species of birds. It is also likely that some birds are genetically more susceptible to these mites than others. They burrow in the non-feathered areas around the cere (fleshy area above the beak), beak and eyes. They may also affect the vent and legs (scaly legs). These mites are very contagious; therefore, if one bird has it, all birds that it came in contact with need to be treated. Secondary bacterial infection and arthritis may occur. It is thought that in many instances, these mites are acquired in the nest, with the infection remaining latent for a long period of time. Early signs of this disease may be seen after six to twelve months. These mites burrow into the skin and the keratin of the bird's beak, causing a powdery appearance to the skin. The beak may look white and chalky. These mites are also found around the vent of birds, on their wing tips, and legs. Sometimes the beak becomes distorted as the mites affect the zone of growth, or the beak starts to grow abnormally long, in which cases regular and life-long beak trims and shapings undertaken by experienced professionals are needed. 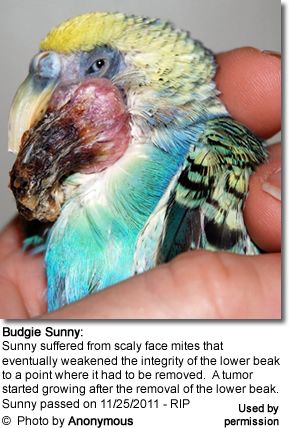 Tiny, scaly, crusty lesions; localized (wart) swellings of tissue appear on the beak or around the cere (the fleshy area above the beak), the skin around the beak and the eyes. 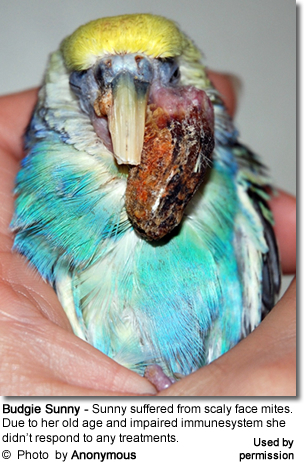 The lesions develop very slowly, so that an infected bird may appear normal for a long period of time. Advanced infestations spread to the unfeathered parts of the body. 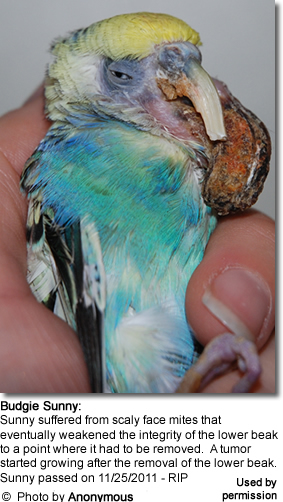 If left untreated, the bird will succumb to the disease. The vet will take a scraping of the affected areas. The mites are present and are visible under a microscope. 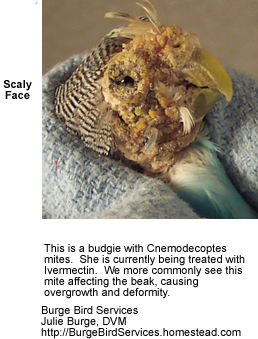 Advanced cases have characteristic crusty / scaly lesions and / or distorted / overgrown beaks. Any swellings can be caused by strangulated fibers or insect bites. Nutritional Deficiency: Birds deficient in vitamin A are particularly susceptible to this condition. Seeds are typically low in vitamin A. This vitamin promotes appetite, digestion, and also increases resistance to infection and to some parasites.